ALCOHOLISM - A Worldwide Curse! MILLIONS are affected by the growing evil of alcoholism. 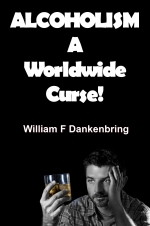 Lives are ruined, marriages wrecked, and homes broken because of this dreadful CURSE! What can be done? What is the ONLY workable solution to this worldwide problem? ALCOHOLISM is the FOURTH-ranking public health problem in the world — and in the United States! In the U.S., only heart disease and cancer cause more deaths. Today there are twenty-five million alcoholics scattered through all nations — including over six MILLION within the United States. Three million others are classified as "pre-alcoholics"! A quarter million new alcoholics join those ranks every year. In France, the nation with the world's heaviest drinkers, alcoholism is the worst health problem. More than 1.6 million Frenchmen and 400,000 women are alcoholics. France has the dubious distinction of having the world's highest death rate from cirrhosis of the liver — 32.8 per 100,000. In 1958, official reports show 15,843 Frenchmen died from the effects of excessive alcohol — a whopping 10 deaths per 100,000 population! In any French town, alcoholics can be seen huddled together in miserable, pathetic groups around the market places. Alcoholics cost the French government well over one billion dollars a year — as much as' it cost to fight the Algerian War! So reported the New York Times. Germany also has its alcoholic problem. West Germany's alcoholic army numbers an estimated 600,000, thirty percent of whom are women. In the European population of South Africa, roughly one person out of thirty — counting men, women, and children — is an ALCOHOLIC! The growing army of alcoholics numbers 370,000 strong. Great Britain also is plagued by the alcoholic curse, with over 500,000 victims of drunkenness. Even in India, where prohibition was attempted, the plan to halt the march of alcoholism ended in failure! In Canada, nearly 300,000 are classified as alcoholics. An alarming SIX PERCENT of all drinkers in Australia are alcoholics. The average Russian spends $100 a year on vodka. Authorities are waging a hard-fought war on alcoholism. The problem of alcoholism is a growing WORLDWIDE PLAGUE! But why? WHY should alcoholism be a growing menace in our supposedly "enlightened" age? One out of every 36 Americans is a victim of alcoholism. Roughly 25 million people in the U.S. are directly affected by chronic alcoholism, including the families of alcoholics — one eighth of the population! Alcoholism directly or indirectly affects your life! EVERY STRATUM OF SOCIETY in the United States is touched by this plague. No class is excepted — no group is spared. The amazing fact is that less than three percent of all confirmed alcoholics are the familiar Skid Row bums and gutter derelicts! The tentacles of alcoholism reach out to encompass businessmen, WIVES, and TEENAGERS! In every American town, on both sides of the tracks — in respectable neighborhoods and dingy slum districts — the rising tide of alcoholism sweeps over an ever-increasing number of helpless, dazed victims! Between 35-40 percent are women. Many are bored, depressed middle-class housewives. Americans spend more than $15 billion a year on alcoholic beverages. About 20 million gallons are gulped down daily. Consumption of distilled spirits in 1967 was estimated at more than 325 million gallons. Business drinking has become so prevalent in the United States that scientists have coined a new name for the business drinker —"the half man." He is the man who only operates at half-speed and has impaired effectiveness due to his morning hangover and four-martini lunch! Industry loses from $2 to $3 billion a year due to alcoholism. It accounts for more absenteeism than either accidents, employee turnover, poor production or poor morale. Every major city in the U.S. spends one million dollars yearly — or more — taking care of drunks and alcoholics. More than 2 million arrests in 1965 — ONE OUT OF THREE of those arrested for all causes — were arrested for public drunkenness. Jails are jammed, courts are clogged, and police forces are overburdened. Arresting drunks is a revolving-door process. In 1964, in Los Angeles, some drunks were arrested as many as 18 times for drunkenness. Some inebriates have been arrested 100 to 200 times and have served 10-20 years in short-term jail sentences. Heavy drinking also spurs crime. It is estimated that in the U. S. 25 to 50% of all arrested for felonies have a history of excessive drinking. Many involved in rapes and assaults have been drinking. The financial burden itself is breathtaking. But even more appalling is the tragic cost of drunkenness in the lives of those people affected. Misery, frustration, failure, pain, suffering, and as is often the case — eventual DEATH! According to authorities, the alcoholic goes through four stages in traveling the bottle-cluttered road of out-and-out alcoholism. The first stage, according to Dr. Rappeport, is acute inebriation which he defines as "simple drunkenness seen in the excessive party drinker or spree drinker." This individual is characterized by a flushed face, rapid pulse, slow breathing, slurred speech, red eyes, and unsteady equilibrium. The second stage is acute tremulousness — or the "shakes" caused by steady drinking for different periods and poor eating habits. The third stage is acute alcoholic hallucinosis which comes after prolonged excessive intake of alcohol. The victim hears voices and often thinks somebody is trying to kill or harm him. Finally, the fourth stage — delirium tremens — comes. Following a long history of constant alcoholic consumption, the alcoholic becomes "terrified, irritable, and confused." He doesn't know what time it is, where he is. He cannot rest or sleep. He runs a fever and may have convulsions! Once an individual is caught in the grip of alcoholism, he goes down fast. When he reaches the stage of constant drunkenness, he cannot hold a job. He becomes penniless — a shabby, tattered bum — a gaunt wreck of a man. These poor wretches, totally down and out, often cannot afford to buy "respectable liquor." Kerosene and buttermilk. Only a few of the desperate down-and-outers dare tackle this concoction. It almost completely wipes out the mind of its victim! What is the cause of alcoholism? Why do MILLIONS wallow in drunkenness? WHY do businessmen, wives, teenagers, young and old, rich and poor, educated and ignorant alike become the cringing slaves of alcoholism? Some people have thought that alcoholism is like any other disease. Such is NOT the case! A professor at Northwestern, Jules H. Masserman, declared, "In some 30 years of intensive interest, laboratory experiments, and clinical experience in the field," he did not find "convincingly controlled evidence" which showed any "consistent physiological causes of alcoholism." Addiction to drink may better be compared to the disease of gambling! Is alcohol itself the cause? Many people think so, and consequently many so-called "temperance" organizations (they really believe in abstinence, not temperance) stump the land preaching the evils of "demon rum" and strong drink. But alcohol itself is NOT the cause! An expert on alcoholism, A. J. Mac-Lachlan, chaplain of a mental hospital, stated forcefully, "It is now fashionable to think of his [the alcoholic's) difficulty primarily as a medical problem, when in reality it is predominantly a MORAL AND SPIRITUAL PROBLEM." At the bottom of the alcoholic abyss lies the root cause of the problem — MORAL AND SPIRITUAL DECAY! Alcoholism is NOT fundamentally a physiological disease which preys upon men. Nor is it due to merely drinking alcoholic beverages. Alcoholism is due to a spiritual disease — a disease of CHARACTER! MacLachlan explains: "Unfortunately the disease approach has become a BOOMERANG, producing physiological side effects that were not anticipated. The alcoholic finds it an easy way out. If a mysterious invader — a kind- of alcoholic virus — can be blamed for his condition, who can hold him morally responsible?" He continues, "As a consequence, many alcoholics adopt an attitude that is passive, defeatist and uncooperative. They say to the therapist, 'Here I am, Doctor. I'm your problem. Give me the pill that will cure me'" (Maclean's magazine). "Characteristically," reports Dr. James Roeder Bell, M.D., "the alcoholic does not want help — he wants alcohol. And, like all who find their environment cruel, he is so much occupied with himself that he cannot consider others. He is unable to respond to ideas such as how much disturbance he is creating, how much time he is consuming, how unattractive he is, and how many billions of dollars are BEING WASTED in the almost futile effort to do something for him" (New Medical Materia). Notice! The alcoholic "does NOT WANT HELP — HE CRAVES ALCOHOL"! His attitude is passive, defeatist, uncooperative! In other words, he does not care about his condition, what other people think of him, or how much money society throws away on him! All he cares about is himself. He is selfish! In the vast majority of cases, the alcoholic does not want help and is not willing to help himself. He is too fond of his stuporous condition to be conscious of the brutal facts of reality. There, if you see it, is one of the reasons millions have become ALCOHOLICS — and millions more turn to drunkenness! Overindulgence in alcoholic beverages becomes a substitute for LIFE ITSELF! Drunkenness produces a dream land euphoria, a great intoxicated calm, an unconcern for reality! Millions fall easy prey to alcoholism because they want ESCAPE! They do not have the character to face life on its own footing. To them life is a hopeless stream of futility and frustration, anger and resentment, unwanted trials and bitterness. They seek refuge — a convenient "escape hatch" — A WAY OUT OF IT ALL! They turn to the false bliss of drunkenness in order to drown their problems and wash away their sorrows! Fleeing the frustrations of business life, seeking relief from a nagging wife, simply being unable to cope with family responsibilities — unable to keep ahead of the bill collectors, having in-law trouble, feeling the pressure of social life, or being plainly addicted to alcohol, ignorant of its potency — millions of men and women succumb to alcoholism! It is no wonder that the CURSE OF ALCOHOLISM plagues the world and stalks every thirty-sixth American! To millions, the abuse of alcohol has become a FALSE God, an ever-present source of comfort and succor! Whenever they feel defeated, despondent, depressed, or discouraged, they turn to drunkenness — not God — for solace. Alcoholism becomes a species of idolatry! The result? A fleeting sensation of pleasure — perhaps — but then a hangover tomorrow, misery and finally DEATH! The wrong use of alcohol is a vicious IDOL which captivates, traps, ensnares, and ENSLAVES! Alcoholism is just another form of SLAVERY! What is the answer to this horrifying problem? There Is hope for the alcoholic! The alcoholic, declares MacLachlan, is the architect of his OWN disaster.... In other words, he created his own predicament — he wasn't shoved into it by one or more outside, invisible forces. Therein lies hope for the future. Since the alcoholic maneuvered himself into his present jam, he can extricate himself from it by exercising his free will, by mobilizing his strength." No alcoholic can lick his problem until he is willing to face it. He himself must make his decision — and ACT. But he needs more strength than he alone can muster. Organizations devoted to helping alcoholics recognize the benefits that come from the added help of God. The alcoholic must be willing to do his own part — he must DESIRE to conquer the problem — but God's supernatural HELP, when sought by the alcoholic, will give him the POWER TO OVERCOME! The one sure way to solve life's constant and endless problems is simply this — LEARN TO KNOW THE TRUE God! Yes, God Almighty is the ANSWER! There is a way to escape the clutches of alcoholism — and that is through the power of God! To those afflicted with the curse of alcoholism, God offers spiritual help! God offers the power of the Holy Spirit to enable a person to overcome ANY sin! Paul was inspired to write "I CAN DO ALL THINGS through Christ which strengtheneth me"! (Phil. 4:13). So can any man caught in the grip of foul addiction! But the decision must be made by each individual. An alcoholic must become thoroughly disgusted with himself and REPENT of his condition. He must call upon God — CONSTANTLY, perseveringly — for HELP. He must draw CLOSE to God in CONSTANT PRAYER, fervent and meaningful BIBLE STUDY and learn to live God's way of life! Then, his life — once a tragic FAILURE — will become a life RENEWED with hope, faith, happiness, love, JOY, scintillating INTEREST AND REJOICING! Warning against drunkenness, the apostle Paul wrote: "Know ye not that the unrighteous shall not inherit the kingdom of God? BE NOT DECEIVED: neither fornicators, nor idolaters, nor adulterers, nor effeminate, nor abusers of themselves with mankind, nor thieves, nor covetous, NOR DRUNKARDS, nor revilers, nor extortioners, shall inherit the kingdom of God" (I Cor. 6:9-10). It takes the power arid — if you please — the fear of God to conquer alcoholism. Through the power of God, alcoholics have overcome these temptations! Paul was able to write to the Corinthians: "AND SUCH WERE SOME OF YOU" (verse 11). Paul exhorted, "There hath NO TEMPTATION taken you but such as is common to man: BUT GOD IS FAITHFUL, who will NOT suffer you to be tempted above that ye are able; but will with the temptation also make a WAY TO ESCAPE, that ye may be able to bear it" (I Cor. 10:13). Your Bible commands: "Be not drunk with wine, wherein is EXCESS; but be filled with the Spirit"! (Eph. 5:18.) God allows the presence of alcohol — to TEACH man to control his desires and MASTER his inclinations! There will be no alcoholics in the World Tomorrow! There will be temperance, not the fiasco of prohibition! It will take the power of the KINGDOM OF GOD to solve today's worldwide problem of alcoholism and drunkenness! There will be no Skid Rows — there will be no gutter derelicts — there will be no toxic chemical concoctions drunk by half-crazed men — there will be no "D.T. 's" or "delirium tremens." God's laws will be ENFORCED for our own good. God's Laws were ordained to bring us peace, prosperity, abundance, happiness, and joy running over. For the first time in the history of the world, men will be radiantly happy, supremely content, leading energetic and industrious lives full of real PURPOSE, deep meaning and security! There will be no "escapism" for there will be nothing to "escape"! When God intervenes in world affairs, the curse of alcoholism will be stamped out completely. No longer will families be broken up, friends torn apart, children grieved, and authorities bewildered at what should be done! Men will learn temperance in all things. What a world that will be! If you are an alcoholic, the FIRST thing you need to do is realize your condition. Too many alcoholics never conquer their problem because they refuse to face it! Then, you need to realize there is an Almighty GOD in heaven who wants to HELP you overcome your problem, completely! But that is not all. The solution to the problem of excessive alcohol begins with the desire to quit drinking. In Biblical language this is called repentance. The alcoholic needs to turn to God for strength to master the bottle. Personal counsel is also vital. Another vital point is this Warning: If you have been a drunkard or alcoholic, and have found yourself unable to control your drinking, experience proves that the only way you can conquer your problem is TOTAL ABSTINENCE. Trying to "regulate" your drinking, after you have already been ensnared, is NO ANSWER. Rather, the bitter record of experience shows that in most cases the alcoholic must QUIT COMPLETELY, once and for all, and not deceive himself that "one little drink Won't hurt." The fact is, for the extreme case, just "one little drink" invariably means he is right back where he started, completely unable to control himself. If you sincerely want to overcome alcoholism, you must decide to QUIT drinking alcoholic beverages, entirely. Too many would-be quitters think within themselves. "Well, one more drink won't hurt me." But, one more becomes a never-ending chain of drinks — there is ALWAYS "just one more"! If you are going to conquer the addiction, you must set yourself to stop drinking, ONCE AND FOR ALL! Don't make the mistake of thinking you can "taper off." It doesn't work. And once you have successfully quit, don't think you can go back to drinking alcoholic beverages. You may very likely wind up where you were before — stoned, soused, inebriated, DRUNK! You must NEVER let your guard down. Study carefully the advice in II Peter 2:20-22. If some escape the clutches of alcoholism, but "are again entangled therein, and overcome, the LATTER END is WORSE with them than the beginning" (verse 20). Once having made that momentous decision to QUIT, you must plan your strategy for avoiding all future temptations. You must decide to stop fellow-shipping with the same alcoholic friends, the same inebriated crowd. Remember the scriptural principle, "... evil communications [associations] corrupt good manners [morals]" (I Cor. 15:33). Don't "hang around" with the old "gang" lest you be tempted and slip back into the rut. Perhaps, for some, even a change of environment, a change of scenery, is necessary. The "old familiar setting" will not then be able to lure you back to the bottle trail. You will be able to have a FRESH START — this time, with the supernatural help of Almighty God! You need to read the very helpful, inspiring articles, "How to Be an OVERCOMER" and "The Answer to Unanswered Prayer." These articles will show how YOU can have divine INTERVENTION on your behalf so you will not have to remain a cringing, abject slave to alcoholism!